Posted by plassaaj on Monday, September 1, 2008 in Diffusion Tensor Imaging, Diffusion Weighted MRI, News. A. Landman, P-L. Bazin, and J. L. Prince. “Tensor Interpolation by Concise Local Estimation of Anisotropy and Rotation”, In Proceedings of the Workshop on Computational Diffusion MRI at the 11th International Conference on Medical Image Computing and Computer Assisted Intervention, New York, NY, September 2008. In diffusion tensor imaging, tensors represent the oriented probability of intra-voxel water diffusion. These positive definite, symmetric matrices form a non-Euclidean space which poses challenges for interpolation and analysis. In particular, most tensor interpolation schemes have a non-linear effect on the clinically important tensor attributes of fractional anisotropy and mean diffusivity, resulting in tensor “swelling.” We propose a new interpolation method that explicitly preserves userspecified interpolation of fractional anisotropy and mean diffusivity, while independently interpolating diffusion directions. The approach leads to an efficient technique that is practical for routine use. 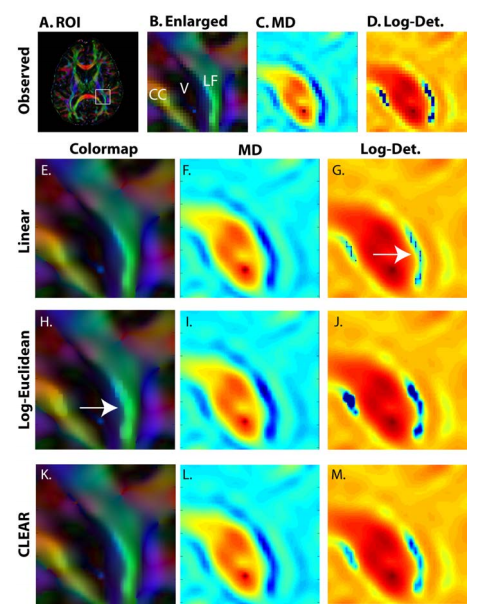 Interpolation of the genu of the Corpus Callosum (CC) and longitudinal fasciculus (LF) near the lateral ventricle (V): region of interest (ROI) selected on an orientation color coded anisotropy map (A,B). MD (C) and log-determinant (D) are shown at the reconstructed resolution. Upsampled (4 × 4) and interpolated contrasts are shown for linear (E-G), Log-Euclidean (H-J), and CLEAR (K-M) tensor interpolation. While the linear interpolation has smooth FA and MD (E,F), it exhibits abrupt changes in the determinant (G). The Log-Euclidean interpolation exhibits FA artifacts in regions of high anisotropy and curvature (H). CLEAR avoids all these problems.